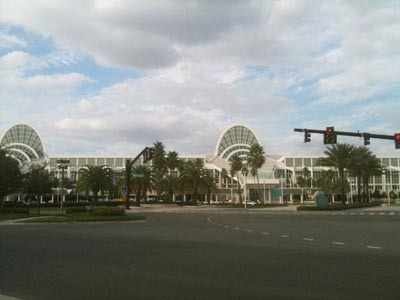 ORLANDO — This year’s LDI show, which has moved to the south concourse of the Orange County Convention Center, appeared to be well-attended, with plenty of activity and product innovation — much of it by advances in LED technology — on display, not just at the New Technology Breakfasts and demo areas but on the show floor as well. A.C. Lighting (#903) will have new gear from Chroma-Q, Jands, and Artistic Licence, including Color Block 2, Color Force, and Color Charge products, plus the Magic Box EtherSwitch 7. New from Jands is the Vista 2 Byron, set to launch early next year. Details at www.aclighting.com/northamerica. A.C.T Lighting (#209) is showcasing grandMA consoles from MA Lighting, the newly automated BB7 and other fixtures from i-Pix and the GDS LiteWare battery-powered RGB Uplighter. Details at www.actlighting.com. 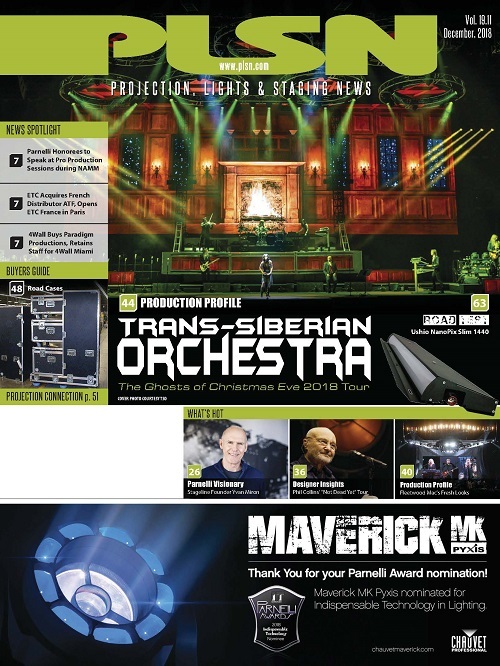 Analog Way (#345) is showing its new Seamless Switchers line — the Opus (OPS300), Pulse (PLS300) and SmartVu (SVU300), and also the Di-VentiX II (DVX8044), the Tetra VIO (TVC401) and the Orchestra (ORC50) remote controller. Details at www.analogway.com. Anvil/Calzone Case Companies (#450) will feature products engineered for the lighting industry, and Anvil Cases found Larry Vallas will be on hand at the booth Nov. 21. Details at www.calzonecase.com and www.anvilcase.com. 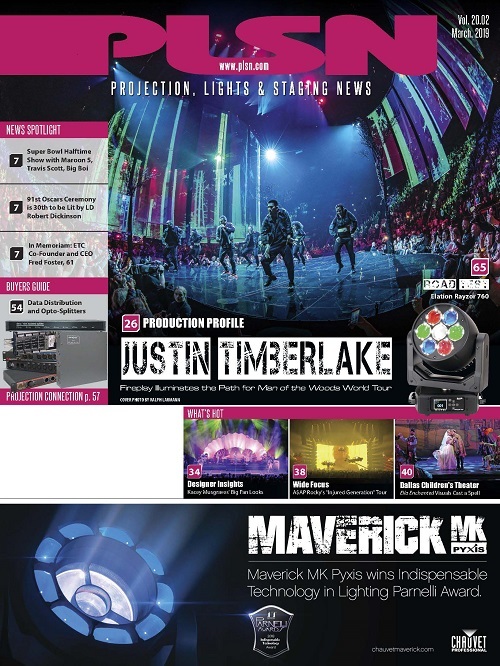 Chauvet (#183) will introduce 17 new products, including an expanded Legend series — the Legend 1200E Spot and Wash, the Legend 700E Beam and Spot, and the Legend 300E Beam and Spot — plus the new COLORado Tour Series, the Q-Spot 260-LED, the Intimidator Spot XYZ, the SparkliteLED drape, the SkyScan 4000 CMY and the Followspot 1200. Details at www.chauvetlighting.com. Clear-Com (#556), a Vitec Group brand, will exhibit a new two-channel version of its Tempest 2400 wireless intercom system. Details at www.clearcom.com. coolux (#569) is featuring Pandoras Box version 4.5 and the Widget Designer PRO, plus the premiere of Lightforce, a collaborative effort with Lightwave International (#1751). The Lightforce laser VLP-3D features synchronized laser and video rendering. Details at www.coolux-us.com. Creative Stage Lighting (#451) is showing Compulite’s Vector Violet and Ultra Violet consoles and JB-lighting’s new JBLED A4, which extends the JBLED A7 with a design well-suited for smaller environments. CSL will also feature products from Wireless Solution and Dura-Flex cable. Details at www.creativestagelighting.com. Dadco (#1158), maker of the Sunray (#1059) line of HMI-type discharge lighting fixtures, is featuring new 24kW discharge light fixtures, the Challenger and the G4. Both fixtures can be converted to operate as a 12, 18 or 24kW light. Details at www.dadcopowerandlights.com. Elation Professional (#703) is featuring its Elation Platinum Spot 5R, which uses a new light source technology for output comparable to a 575-watt fixture in a moving head fixture that’s half the size and weight of a typical 250-watt fixture. For details jump here or visit www.elationlighting.com. eldoLED is featuring its PowerPIX modules at the PIXLED booth (#1535), which are strings of RGBW LED pixels and the LINEARdrive 100. Details at www.eldoled.com. The ESTA-sponsored Connectivity Pavilion (#1349) includes an array of equipment running the latest in entertainment control protocols — RDM (ANSI E1.20), ACN (ANSI E1.17), and Lightweight Streaming of DMX512 over ACN (ANSI E1.31). J. R. Clancy (booth# 1702) is featuring its PowerLift T with SureTarget, which pairs the motorized, fixed-speed hoist with a controller that provides accurate, repeatable positioning, with four user-definable preset stops. Operators press the up or down button to move the batten to the preset position. The company is also featuring the Altus rigging control system and SureBrake II. Details at www.jrclancy.com. Kinesys, at TMB (#1283) is introducing the Evo Hoist Controller. It is compatible with Kinesys K2 software, and one-ton 40-foot-per-minute and half-ton 80-foot-per-minute hoist options are available. Details at www.tmb.com. LSC Lighting Systems (#1103) is featuring LSC Clarity, a PC/MAC based Lighting and Media Server control system, developed by Nick Denville from OpenClear Pty Ltd. Details at www.lscclarity.com and www.lsclighting.com. 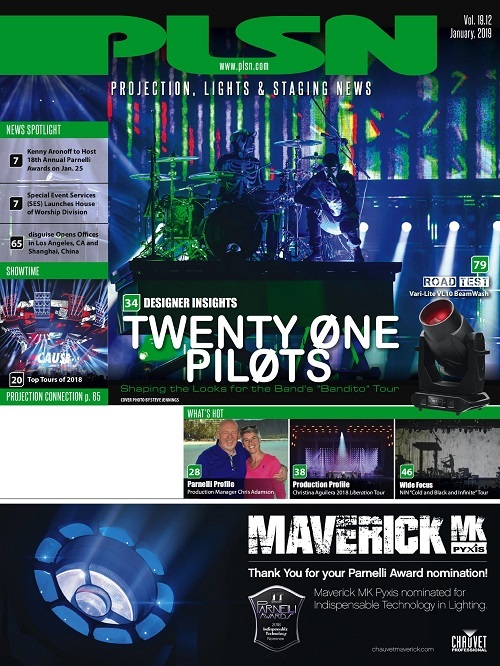 Martin Professional (#1763-1769) is showing its first LED moving heads (MAC 401 Dual, MAC 301 Wash), new LED video solutions (LC Plus Series and P3-100 System Controller and FlexDOT LED pixels), LED luminaires for indoor and outdoor use (Tripix), LED striplight (Easypix) and the MAC 250 Beam, a new compact beam fixture. The company is also showing its Maxxyz Modules, iPhone MaxRemote, Maxedia 4, ColorFox Vxo1 for architectural use, Jem ZR44 Hi-Mass and RADAR (in conjunction with Wybron, #1181). Details at www.martin.com. Philips Color Kinetics (#926) has two LED floodlights geared for touring, the ColorReach Powercore and iW Reach TR Powercore. They are based on the company’s ColorReach Powercore floodlights, and the new gear is positioned to replace multiple flood and wash fixtures for large applications involving long throw distances. Details at www.colorkinetics.com. Philips’ (#927) MSD Platinum 5 R lamp is a new stage lamp designed to fit compact fixtures, creating brighter output with a very short arc. Philips is also featuring its latest FastFit and MiniFast Fit lamps. Details at www.philips.com/lighting/entertainment. PixelRange (#969) is featuring its PixelPar 44 Mi, the first in a new series of products, plus PixelLinear quad color LEDs, SkyLine Architectural LED floodlights, Pixie IP66-rated decorative lighting effects including PixiePoint, PixieMini, PixieNode, PixieBall, and PixieStar, and Pix by PixelRange, a line that includes the new Pix120m, Pix60 and PixPar38. For details, www.pixelrange.com. 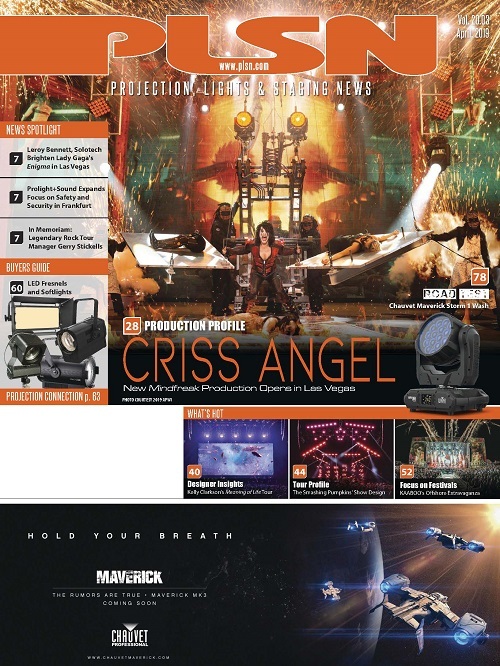 PRG Distribution (#650, #745 and #759) is featuring arKaos, ChamSys, Clay Paky, Fog Factory, PowerQuick, RetroScent, Spotlesslight and other brands. Clay Paky highlights include two moving mirror fixtures — the StageScan 1200 and Golden Scan 4 — and the Alpha Series fixtures. The PRG demo room (N210) is showing PRG’s Bad Boy fixtures, Mbox Extreme V3 media servers and the V676 lighting control console. Details at www.prg.com and www.prgdistribution.com. 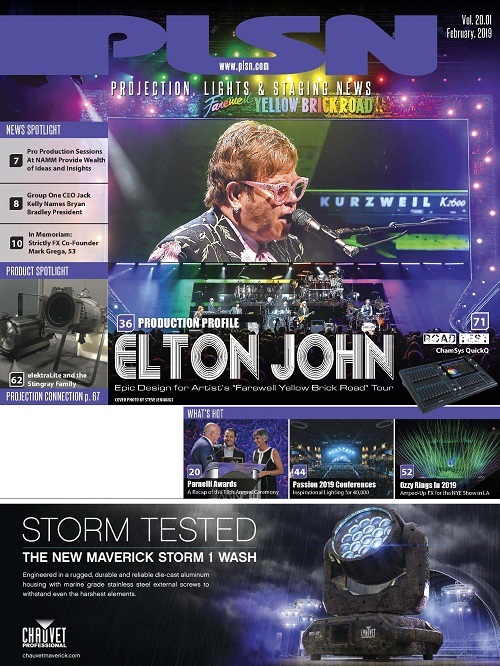 Robert Juliat (#913) is featuring its Lancelot 4kW HTI followspot and effects projector, used at Ben Hur Live at the O2 Arena and the Beijing Olympics and the Horus, a tungsten cyclorama light that Robert Juliat is reintroducing in this, the company’s 90th year. Details at www.robertjuliatamerica.com. Sapsis Rigging, at James Thomas Engineering (#443) will show ProPlus line of fall protection gear and the SRI Focus Track System. Details at www.sapsis-rigging.com. Strong Entertainment Lighting (#429) has an new LED fixture, the Solutions 650, that can produce 24 foot candles over a 23-square-foot field from a 650-watt outdoor luminaire mounted 400 feet away. The company is also featuring a new line of trouping power supplies. Details at www.strong-lighting.com. Swisson (#836), which expects to be offering ETL-listed/certified products as of January 2010, is featuring a new line of RDM splitters in a variety of different housings and connection types and the XSD-D Satellite sine wave dimmer with power manager, an addition to its line of sine wave dimming products. Details at www.swisson.com. Tomcat (#1027) is showing (core), Edge, Sky and Columbus McKinnon hoist products. (core)20 has been added to the line, and (core)12 is also featured in the New Product Showcase (#1827). Edge is in the Green Product Showcase (#1363). Details at www.tomcatglobal.com. Vaddio (#1519) is highlighting the ClearVIEW HD-18 PTZ camera. The Panasonic AW-HE100, Canon BU-Series and the Sony BRC-Series and EVI-Series of PTZ cameras are also on display, along with new seamless switchers — the ProductionVIEW HD-SDI and ControlVIEW XHD — and the UXHD CrossPoint, a video scaler/converter. Details at www.vaddio.com.